It's the most wonderful time of the year - New York Rangers playoffs! 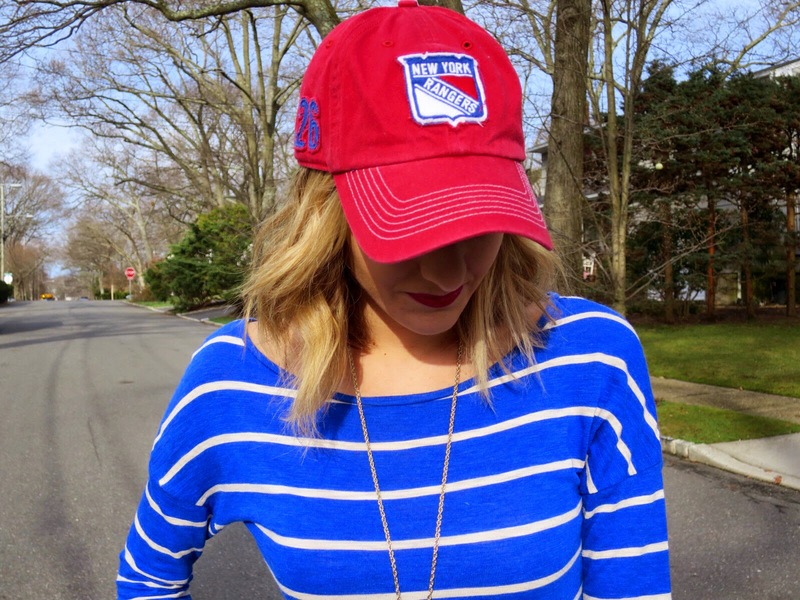 I shared a transitional work day to game day look back in December & my superstitious self is sure that sharing my look with all of you is part of the reason the Rangers skyrocketed up to first place & had one of the best second halves of a season ever! So here I am, playoff time, sharing a springier yet still just as spirited playoff look & hoping for the same type of good luck for the boys in blue! Here's to lots of great playoff hockey games this spring & lots of good luck to the Rangers in their quest for the cup!! Fingers crossed!!!! Are you a hockey fan? Which team are you rooting for? This red, white and blue look is so cute! I especially love the denim jacket around the waist - nice touch! Wishing the Rangers best of luck in the playoffs! Thank you! Fingers crossed for some great games! Yay for the playoffs! I hope the Rangers win it this year! If it's not them, I hope it is any other team but the Penguins. Ha! LOL - well here's to a great first round then! The Rangers play the Penguins tomorrow! This is so cute! I love that striped dress. You look so sporty and adorable! Thanks - I have been obsessed with sporty styles lately! So cute- love this sport + chic combo! Such a classic look! I love it too! NYR were so close last year. Although the dream cup final ( for the NHL at least ) took place last year between the NYR and LA Kings there won't be a rematch. (Thanks to my Flames taking LA out of the playoffs in the second last game of the year) NYR have cruised to the second round, my Flames are in a battle to get there. Both you and your team are "Lookin' good"
Yes - so close! Hoping we get even closer this year ;) Congrats to the Flames on Round 2 as well!